Ballpark Estimate: $0.30 to $0.60 a gallon. With the high cost of filling your gas tank today, you might be interested in understanding the process and the real costs associated with getting the gasoline at your local station from the crude oil at the refineries. Oil companies are making record profits and it is easy to cast them as villains out to gouge the consumer, however, while oil companies are generating record total profits, their profit margin is actually falling. The following is a brief overview of how the refining process works and how profits margins are calculated. According to the U.S. Department of Energy (D.O.E), the refining of crude oil produces such widely used end-item products as reformulated (sulfur-free) and conventional gasoline, kerosene-based jet fuels, lubricants such as motor oil, as well as home-heating fuel, kerosene, asphalt and road oil. Most of these products are used primarily in four different ways. They can be burned, as is the case for gasoline, jet fuel, and diesel fuel to provide the energy for driving automobiles, trucks, airplanes, ships, etc. ; to heat a building; to supply the energy for driving electric-generating turbines; and to create petrochemicals and products such as plastics, polyurethane, and a myriad of other petroleum-based goods for the consumer. First – a word about the refining process. Simply stated, because crude oil is made up of a mixture of hydrocarbons, the first step in the refining process is to separate the different types of hydrocarbons from the mix. This is accomplished by heating the crude oil in a process similar to that used in a “moonshine-still”. During the course of the distillation process different products are boiled off and extracted at different temperatures. For instance, at the lowest temperatures, less than 360 degrees F., the lighter products are recovered such as butane, naphtha, and low octane gasoline. The yield at this stage is about 20 percent gasoline and about 50 percent residual crude. As the temperature rises to 650 degrees F., distillates such as jet fuel, kerosene, home heating oil and diesel fuel are recovered next. Finally, at the more sophisticated refineries, the residual oil that is left, the heaviest and least valued of the crude is processed even further at temperatures over 1000 degrees F. to extract even more of the lighter products, principally gasoline. By using these extra steps in the process, gasoline yields of around 60 percent can be obtained with only about 5 percent residual. Additional processing of the gasoline from that point can, among other things, remove the sulfur content and for some of the gasoline, produce a higher octane, which because of this extra processing will cost you more at the pump. Keep in mind that because of many variables, including different taxes levied, seasonal changes and different blends required in the refining process, the cost of obtaining a gallon of gasoline for the Virginia market will be less than for a gallon of gasoline sold at the pump in California. In California, where much of its oil comes from refineries within the state, special laws call for specific requirements for lead content and other additives as well as unique gasoline formulations to prevent smog and other environmental considerations. These extra requirements relate to higher refining costs that will be passed along in the Cost To Refine Oilhigher pump prices. Also, since the quality of all crude oil varies widely, it should be noted that the level or ease (and cost) of refining depends a great deal on the quality of the crude. For instance, premium crude oil from Texas, called West Texas Intermediate has the most desirable characteristics for producing the lighter products like gasoline while premium crude from Nigeria is easier to refine for middle distillates like home heating oil and jet fuel. In direct contrast, the refining of Saudi Arabian Light will yield about 50 percent heavy residual crude that must go through the more costly additional processing. The Gulf Coast is the leader in oil refinery capacity in the U.S. and has the greatest concentration of state-of-the-art facilities in the world capable of refining the heavier residual crude. This region supplies refined products to both the East Coast (more than half of the gasoline, heating oil, diesel, and jet fuel) and to the Midwest (more than 20 percent). As stated earlier, California operates its own reformulated gasoline program. As we all know, the developed industrialized countries consume more crude oil than any of the others with the United States (21 million barrels per day) firmly fixed at the top of oil consuming nations behind China (7.3 million), Japan (5.2 million), Russia (3.1 million) , and Germany (2.6 million). To process our oil, the D.O.E. reported that as of April 1, 2008, the number of operable refineries in the U.S. was 150 with 4 presently idle with an operating capacity of around 17,594,000 barrels per day. 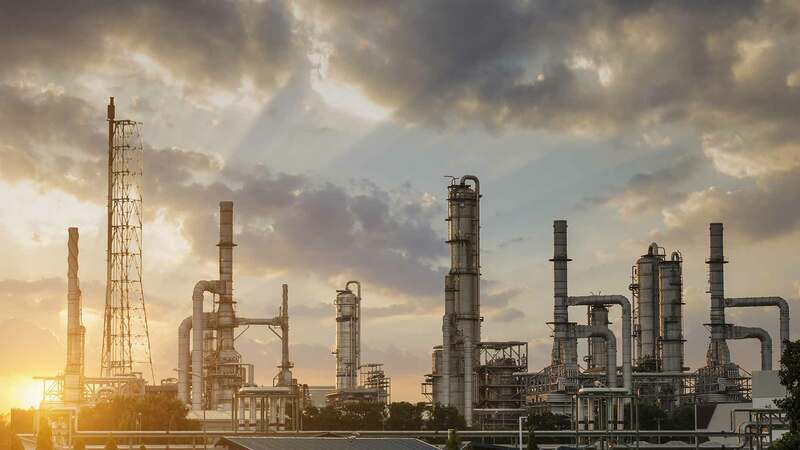 The gasoline yield from these refineries was reported to be 42.3 percent, while a yield of 27.6 percent was for home heating/diesel fuel, and 9.5 percent for kerosene-based jet fuel. The five largest oil refiners in the U.S. today are ExxonMobil, ChevronTexaco, BP, Shell, and ConocoPhillips. Ten years ago these five companies controlled only 34.5 percent of oil refinery capacity. Since then, however, as a result of government-approved mergers they now control some 56 percent of the refinery capacity. Some believe these mergers were designed for self-serving purposes. One, to maximize profits by eliminating independent refineries so as to tighten refinery capacity and two, because of their strong market position, to manipulate gasoline supplies by intentionally withholding supplies or by placing refineries offline because of some “mechanical glitch”. Oil executives, however, say they have no incentive to withhold supplies by going offline because that forces them to buy extra gasoline on the wholesale market, or spot market to fill customer orders while at the same time having to continue paying their workers and extra maintenance personnel. In fact, to make up for the limited number of refineries oil companies have spent millions to upgrade the production capabilities of many of their facilities in order to provide them with the capability to refine the heavier residual crude. So What Is the Profit-Margin for Refining Crude Oil Into Gasoline? As of 1999, for every gallon of gasoline refined from crude oil, U.S. oil refiners made an average profit of 22.8 cents. By 2004, the profits jumped to 40.8 cents per gallon of gasoline refined. In the specialized California market where the gasoline must conform to the requirements of the California Air Resources Board, refinery margins were even higher. In fact, this helped Exxon, the largest company, report a profit (as of February 2008) of $40.6 billion. Nevertheless, one financial tracking institution reported that the profit-margins have now dropped to about 29.6 cents a gallon or around 60 percent lower than a year ago. In a simple illustration, let’s assume an oil company is paying $100 for a barrel (42 gallons) of basic crude oil. Their cost for a gallon will be about $2.38. At a gasoline-pump price of $4.00 per gallon, 44 cents has to pay for taxes and 20 cents for distribution and marketing expenses. This leaves $3.36 for the oil companies. Out of that total they have to pay for the cost of the gallon of crude oil itself which was $2.38 and also the 40 cents to refine it into gasoline. This leaves $0.58 profit per gallon of gasoline. As noted, however, depending on which report one looks at, this profit-margin can range anywhere between an estimated 30 to 60 cents per gallon. Oil Companies Caught in a Double Bind? The oil companies, however, express much grief that they are actually losing their Cost To Refine Oilprofit-margin because as crude oil prices continue to rise over $100 per barrel, they are finding it increasingly difficult to pass any substantial portion of their added costs onto the consumer. Like everyone else, they claim, the oil industry is going through a traumatic period. On one hand they must strive to satisfy their shareholders. But, on the other hand, to keep the investors happy a business must grow to increase profits which, they claim is getting more difficult to do. They are caught in a double bind, experts say. While the price of oil is increasing, the consumption of gasoline in the U.S. is falling. In this regard, although crude oil prices more than doubled in the past year, the oil experts say, wholesale prices for gasoline have risen only 39 percent. Unfortunately, despite the U.S. attempts to reduce oil consumption (3.3 percent in March 2008), that reduction in consumption will be significantly offset by the increased demand for crude oil from developing nations like China and India. And because nearly three-quarters of the cost of gasoline at the pump is traceable to the cost of the basic crude, despite our lessening demand, the price for gasoline will keep rising, a factor mostly driven by the increasing global demand for that all too precious crude oil.